At Northeastern Elementary School, we recognize that education is a lifelong process. Every child is a unique human being with different learning styles, abilities and backgrounds. In order to foster a love for learning, we believe that education is a responsibility shared by students, parents, staff and members of the community. We make “learning” rather than “teaching” the fundamental purpose of our school. Our Professional Learning Community emphasizes a solid foundation in Literacy and Numeracy. We also strive to create an environment where everyone feels safe and valued. Northeastern Elementary School is a Kindergarten to Grade 8 dual track English and French Immersion school located in Garson, Ontario. 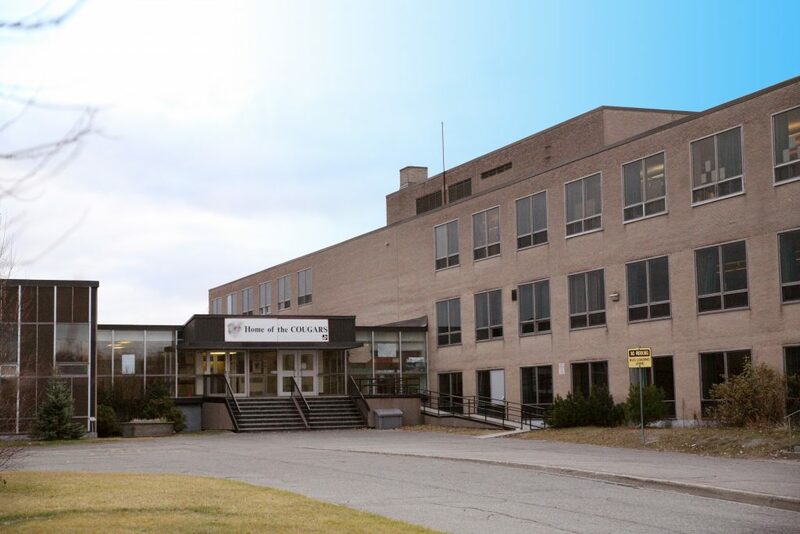 With an enrolment of approximately 500 students, Northeastern is one of the largest elementary schools in the Rainbow District School Board and draws its students from Garson, Falconbridge, Skead, Coniston, Wahnapitae and Wanup. At Northeastern Elementary School, two-thirds of the student population attends regular English classes and one-third is enrolled in the French Immersion Program. Northeastern Elementary School also provides programming for students with special needs in Comprehensive, Autism Spectrum Disorder, Early Intervention, and Learning Disability classes. Students in these classes are drawn from the Sudbury East Area, which includes Adamsdale Public School, Churchill Public School, C.R. Judd Public School, Cyril Varney Public School, Pinecrest Public School and Redwood Acres Public School. Northeastern Elementary School is a sprawling four level building with two large gyms and a cafeteria. The school also has a sub basement that contains a third gym, and a music room. Northeastern Elementary School proudly hosts a number of community partners, including the Northeastern Kids Before and After School Program, Northeastern Kids Daycare (Larch Street Kids), and a Best Start Hub. In addition, Better Beginnings, Better Futures and The Human League sponsor the school’s Breakfast Club, which serves approximately 90 students daily. The school works closely with community agencies, such as The Children’s Aid Society, The Child and Family Centre and The Learning Disabilities Association of Sudbury to provide clinical support and treatment for students in need. Staff members work cooperatively to promote a positive learning environment by providing students with endless academic and athletic extra-curricular opportunities beyond the classroom. Many staff members make up Northeastern’s superior Athletic Committee, which is responsible for organizing and hosting numerous board tournaments at the Junior and Intermediate levels. Northeastern’s dedicated staff also offers a number of clubs for students, appealing to a broad range of interests, such as an Intermediate Tech program, Sign Language, Yearbook Club, Scrapbooking and every sport covered by the Rainbow District Elementary Sports Council. At Northeastern Elementary School, the School Council is a strong supporter and ambassador for the school. As a result, there is a vibrant network of parent volunteers who assist in a variety of events such as Book Fairs, Adopt-a-Family Christmas Campaign, and the Spring Community Clean Up. An Awards Assembly takes place at the end of each year to honour student excellence. Northeastern continues to recognize the importance of character development, community responsibility and service education. Staff and students reach above and beyond to give to a number of charities and programs, such as Jump Rope for Heart, the Terry Fox Run, Sudbury Food Drive, Coats for Kids and Toonies for Autism Campaign. The school has initiated several programs to assist students by actively promoting and rewarding positive behaviour, by hosting monthly assemblies, providing an Alternative Indoor Recess Program, and modelling appropriate play by teaching Positive Playground Games. A Responsibility Room has been established to help students develop essential skills that will enable them to be successful citizens in the community. Looking for child care at Northeastern Elementary School?